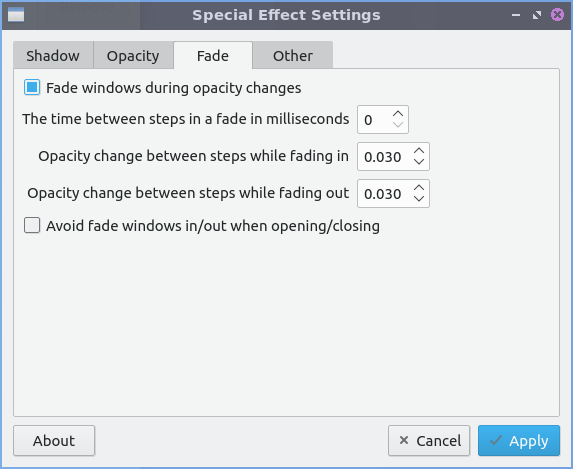 Window effects is a program to manage effects of the Compton X compositor. 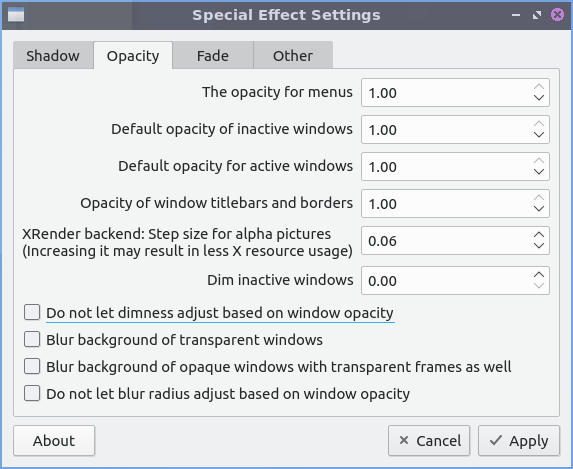 Lubuntu ships with version 0.14.1 of Window effects. The Shadow tab manages how compton draws shadows. To toggle enable client side shadows press the Enable client side shadows checkbox. The checkbox for Avoid drawing shadows on dock/panel windows will stop drawing shadows on the panel. 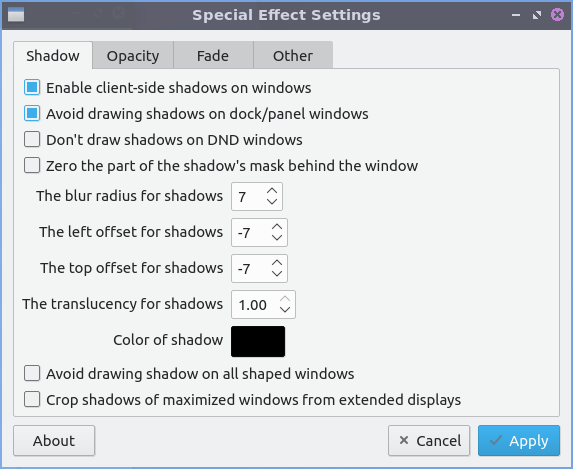 The Color of shadow lets you change the color of shadows from windows. The field for The blur radius for shadows changes how big to blur the shadows. The left offset for shadows is how far to move the shadows to the left with a larger number makes the shadow appear farther to the right. The top offset for shadows the larger the number farther down the shadow appears below the window. The translucany for shadows is how opaque or clear to make the shadows 1 is opaque shadows and 0 is clear. The Crop shadows of maximized windows from extended displays checkbox does not have shadows across multimonitor layouts on other monitors from windows on another. The Opacity tab is for transparency settings. Setting Opacity to 1.00 makes it opaque while 0 makes it entirely clear. Menus, inactive windows, active windows titlebars and borders all can have their opacity changed independently. The Blur background of transparent windows blurs the background of transparent windows. To not change how far a window blurs on window transparency check the Do not let blur radius adjust based on window opactiy. The Fade tab manages fading windows opening or closing or opacity changes. There is a checkbox for Fade windows during opactity changes so if the opacity changes it will smoothly fade. To have a slower time between fade in milliseconds increase The time between steps in a fade in miliseconds. With this settings windows will fade in and out when opened and closed unless you don’t them to which you can check the Avoid fade in out when windows opening/closing. To have your settings applied you will need to press the Apply button. If you want to cancel your changes press the Cancel button. from the command line. From LXQt configuration center press the gear button with a c in it to launch Window Effects. Of course for this to have any effect the compton compositor needs to be running so see chapter 3.2.13 for how to autostart applications.